Find hotel near Charlottetown Founders Ha .. 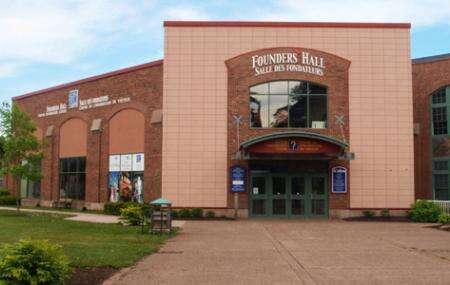 Notable for being Canada’s Birthplace Pavillion, The Founders hall is where the delegates to the Charlottetown Conference arrived at the Historic Charlottetown Waterfront on board the HMCS Queen Victoria in 1864. This heritage bilingual attraction tells the story of Canada from its inception in 1864 up until modern day. It makes for a great starting point for your visit to Charlottetown. Also located inside is the Charlottetown Visitor Information Centre, the ideal spot to start both your City and Island vacation. Friendly vacation planners are ready to search and book accommodations, make restaurant reservations, and highlight attractions, activities, festivals and events. Free wireless internet, and public computers are also on site. There is also a Giftshop on site that carries both city and island souvenirs, and Island Made Products. Seniors (60 & Over)- $8.50. Students- $8.50, Youth (12 & Under) -$6.25. Families (4 or more per group) receive 20% off regular admissions. How popular is Charlottetown Founders Hall? People normally club together St. Dunstan's Basilica and Province House National Historic Site Of Canada while planning their visit to Charlottetown Founders Hall. Dated and boring but good information about who Canada was formed. A fascinating place to visit for anyone interested in the formation of Canada. As a Canadian it was a real eye opener as to the politics that lead to the signing of Confederation. Great place to visit for Canadian history buffs. Great for Canadian history but this place needs a serious update - started to look a little dated. A interesting way to learn about Canadian History (esp. for an American).